Though a cyclone offshore made for rough surfing conditions, we were in the surfing capital of the country, determined to catch some gnarly waves. We had been swept away by a limousine in Brisbane and dropped in Surfers Paradise (that's really the city's name) for a private lesson. Craig, our rad instructor, got us riding in no time, but towards the end I struggled to even stay upright in the choppy ocean. Afterwards, he gave us a lift to the main drag in the hip town, where we found some Aussie food, coffee and sunshine, glad to be back on stable ground. Hopefully next time we'll have better weather. I almost included all of Sydney as one of these top ten experiences - that’s how much I loved the city. But to be fair I narrowed it down to Bondi, the hip beachy neighborhood rivaling Venice Beach in LA. We happened to arrive on a blustery day when the sandswept beach was nearly empty, so we paid a tiny fee and went for a swim in the saltwater pool right on the ocean at Bondi Icebergs, where the cold water actually made my wedding ring fall off. Thanks to a local who lent us goggles, we found the ring, recharged in the sauna, and then went for superb Thai food and gelato. Not only was it an epic day, we felt like we'd uncovered a hidden gem, and connected so well with locals that we started seriously considering a future in Sydney. Not only is this place free, it's awesome. An art gallery and museum in one, it boasts gorgeous Northern Territory aboriginal art, an eerie exhibit about Cyclone Tracy (which destroyed tropical Darwin in 1974), and a fascinating room devoted to Australian wildlife and evolution. Besides the 5.1-meter-long stuffed saltwater crocodile, there are hundreds of preserved specimens like a box jellyfish, the most venomous creature known to science. Two hours was barely enough time to scratch the surface. Next time, we’ll spend a full day there, enjoying the illuminating exhibits while basking in the free air-con. After meeting Ruby, the friendly and curious meter-long goanna lizard who freely roams around the Reptile Centre, our hearts were forever opened to the scaly but soft reptilian creatures. With dozens of fascinating lizards, geckos, and venomous snakes on display, it is an excellent place to learn about the hardy native animals that have somehow managed to adapt to the harsh Australian outback. Since our visit coincided with a 3:30pm show, we even got to handle a blue-tongued lizard, a scary but somehow cute olive python, and an adorable bearded dragon. When our time was up we really didn’t want to give "Beardie" back, and the thrill of holding a (rather large) snake for the first time had us feeling energized and empowered long after we left. An easy two-hour train ride west of Sydney, the Blue Mountains are as accessible as they are beautiful. The area’s namesake hue, which exists because of eucalyptus oil droplets in the air, made for stunning views at every opportunity. Our escape from the city featured plenty of wandering hikes with glimpses of exotic birds and countless waterfalls. When we missed our evening train back to Sydney, aka the “big smoke,” while relaxing with a cold beer, we weren’t all that upset; we didn’t mind staying a little longer. Words can’t describe how happy it made us to cuddle a koala like a baby, pet lounging kangaroos, and feed wild lorikeets. Among the other treasures in residence at Lone Pine: emu, cassowary, dingo, and wombat, just to name a few. And just when we thought we’d seen everything in the park, we stumbled into the platypus aquarium and stood mesmerized, watching the adorable duck-billed monotreme diving over and over to catch a prawn. Even though it's technically a sanctuary for animals, it's most certainly a haven for animal-lovers like us. Learning about the vast history surrounding the iconic red monolith in the middle of the outback added a much deeper layer to our understanding of Australia, but nothing could prepare us for experiencing the powerful presence of these sacred rocks in person. Apart from their infamous beauty, Uluru and Kata Tjuta practically radiated with significance, having been woven into aboriginal culture for tens of thousands of years. Just being near the rocks felt more meaningful than any other place we’d experienced. Our favorite part of the day was sipping champagne and watching the sunset paint the classic rock in oranges, reds and purples. Saltwater crocodiles, or "salties," are some of the largest and most dangerous creatures in Australia, and normally best avoided. But at this Darwin fixture, I was offered the rare chance to interact with these lethal giants. I got to hold a baby croc, feed juvenile crocs, and swim inches from a massive, full-grown croc named Chopper from the safety of the plexiglassed Cage of Death. And as if that weren't fun enough, they also have a menagerie of impressive fish and reptiles. We got to hold another (smaller and much cuter) snake, cradle another beardie, and witness a python eat a rat whole, which was weirdly captivating. Our time at Crocosaurus Cove was a total thrill ride start to finish. 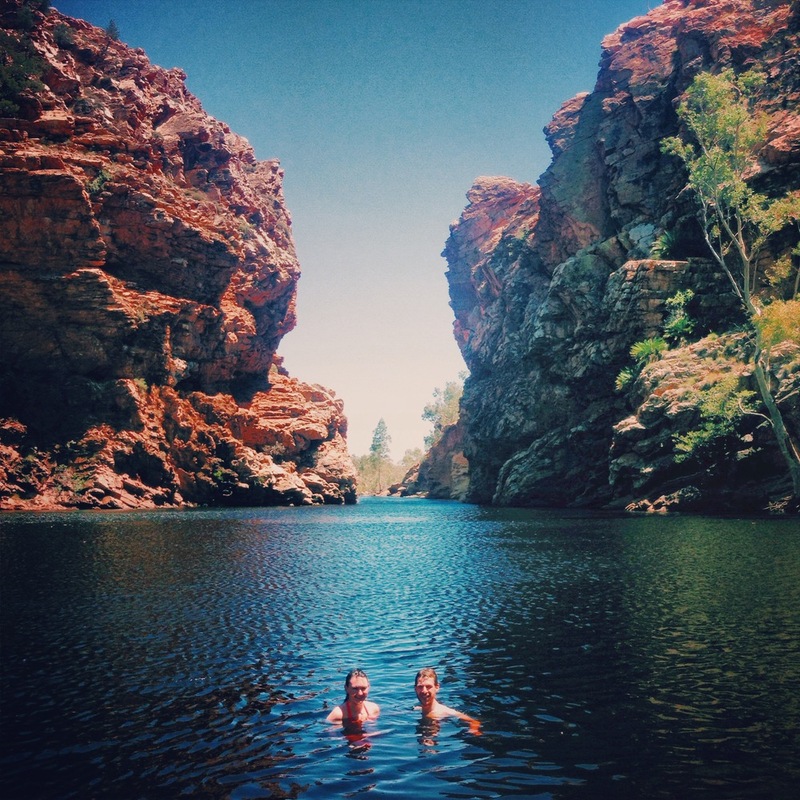 Amid our day of touring gorgeous sights like Simpsons Gap, the Ochre Pits and Standley Chasm, we took relaxing dips in several stunning swimming holes in the West MacDonnell Ranges with our guide, Ben, and a group of six others. The recent summer downpours had transformed this part of the Red Centre into a green paradise, leaving the natural outdoor pools filled to the brim. We jumped in the water at three fantastic spots including the idyllic Ellery Creek Big Hole (pictured below). It was a casual day spent in good company, soaking in the many surprising splendors of the outback. The most amazing experience in Australia, hands down, was our day exploring the world’s largest living organism. This was no park or sanctuary or aquarium - this was the real deal, a wild and colorful underwater wonderland that won't be around forever. On our full day aboard the Calypso, we snorkeled and then completed our first-ever scuba dive at the Great Barrier Reef. After descending a thick rope with our guide, Jenny, we spotted clownfish, sea turtles, and gigantic clams that flinched when we touched them. We even knelt down on a patch of sand ten meters down and passed around a slimy sea cucumber. Our minds were so blown that we paid extra for a second dive, just so we could do it all over again. Those 21 days definitely lived up to a "DTour of a Lifetime,” and I can't thank DoubleTree enough for giving me (and by proxy, Kristen) such an amazing opportunity. The trip was jam-packed with adventures, and ultimately added up to one of the most unforgettable vacations of our whole lives. Disclosure: My Australian DTour of a Lifetime was sponsored by DoubleTree by Hilton.